Mughal-E-Azam, Bobby and Aandhi top our film critic’s Valentine’s Day list. Valentine’s Day is here, romance is in the air, and love is in each and every person’s heart. No one understands these particular emotions better than Bollywood, who for the past 100 or so years has more or less carved the entire industry around the concept of love. It is truly amazing that for such a long period of time, movies on the subject of love have continuously been made, without too much change to the central premises. Yet, time and again, audiences throng to the theaters to witness the torrent of emotions that come with love – sleepless nights, happiness, separation, and heartbreak. Because love itself has so many different shades, the best way to analyze which films have represented these various stages of love the best have to be divided into three categories: tragedy, young love, and mature love. Here are some of the best representations, in my opinion, of these different shades. Undoubtedly one of the most celebrated romantic films of all time, this movie tells the tragic love story of Mughal Prince Salim (aka future Emperor Jahangir, played by Dilip Kumar) who loses his heart to the staggeringly beautiful courtesan Anarkali (played by a heavenly Madhubala), much to the chagrin of his parents, Emperor Akbar (Prithviraj Kapoor) and Jodhaabai (Durga Khote). 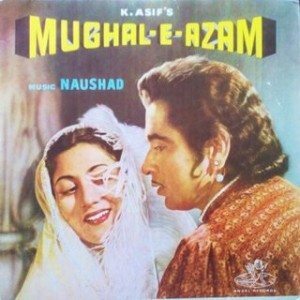 Remembered just as much for its music by Naushad (the song “Pyar Kiya Toh Darna Kya” in particular) as its performances, K. Asif’s Mughal-E-Azam is a staple film for diehard romantics. The love displayed here is of a different time, where poetry reigned supreme and where one’s emotions were masked by the societal boundaries/class distinctions of the day. Yet, one never feels that the passion is not there, and in some ways the purity of the romance comes out as much more intense than something a bit more blatant (perhaps due to the real life love between the leads?). Do not miss this legendary film on this day! Some may question why this is on the list. They may argue that this film does not fit any of the conventions associated with romance, and although it has many a memorable melody, there is nothing that signifies what we expect from a romantic Hindi film. However, those who question this choice must remember that romance is the very core of this movie. The story of a joker who makes audiences laugh while masking his own pain, is motivated entirely by three separate occasions of a broken heart. First, his childhood crush on his teacher, his love for a Russian acrobat who joins his circus troupe, and his romance with a poor woman with aspirations to be an actress. Any words that I can use to try to describe this movie would be fruitless. It just needs to be experienced. This movie will make you laugh and boy, will it make you cry. Raj Kapoor stars, and directs, this autobiographical film which is undoubtedly his best work. A huge flop upon release, Mera Naam Joker has stood the test of time to be a legendary and unique film in the history of Indian cinema. To me, it is movies like this which are the essence of romance. After all, what is the fun in love if there is not a little bit of heartbreak? One of the most powerful films ever made, Sadma is one of those tear jerkers that you will never forget. Starring Kamal Hassan and Sridevi, directed by Balu Mahendra, Sadma tells the story of young man who rescues a woman from a brothel. This woman had been in an accident, which wiped out her memory, and thus reduced her mentally to a small child. The man takes a liking to this woman, protects her, and cares for her while falling in love with her along the way. Without revealing the climax, that is what takes this movie to an all time high. Kamal Haasan’s acting in that final scene will haunt you for years to come, and if you do not start crying, you truly have a heart of stone. The innocence and selflessness of the romance will touch you in a way few romantic films do, and Sadma is an unforgettable tragic piece that must be experienced. Devdas is also one of those immortal love stories that last for generations. Each generation has had its own version of this classic, from the K.L. Saigal version, to the Dilip Kumar version. For my generation, the Shahrukh Khan-Aishwarya Rai-Madhuri Dixit incarnation, directed by Sanjay Leela Bhansali, is the most memorable version of this story. The tale of a rich lawyer, in love with his lower class neighbor Paro, who drinks himself to death when he is unable to marry the woman he loves is iconic. Along his journey of self-destruction, Devdas is befriended by Chandramukhi, the selfless courtesan who loves him but knows very well that he can never be hers. Ismail Darbar’s music, the sets, the costumes, and a bravura performance by SRK make this one of those films for which SRK will be remembered. Another Valentine’s Day staple, if you have not yet seen this film, make this a priority! This Sunil Dutt-Nutan starrer is but one of the many films on reincarnation that are made in India. Telling the story of a poor boatman and high class woman who develop a friendship as the boatman takes her across the river to town every day, Milan is another one of those pure innocent romances that you cannot but help to love. Songs such as “Saawan Ka Mahina” are still remembered to this day, and the performance of Sunil Dutt in this film is one of his best ever. A must watch! There have been many rich boy-poor girl young love stories over the years, but really the pioneer in this genre is Raj Kapoor’s legendary Bobby, starring Rishi Kapoor and Dimple Kapadia. After the failure of Mera Naam Joker, Raj Kapoor was on the brink of financial destruction. He put every chip into Bobby, which would have brought him on the streets if it had failed, but luckily not only was the film a huge success, but audiences found new heartthrobs in the main leads. My father himself, who is not a huge fan of Bollywood movies, went to see Bobby four times because of his crush on Dimple Kapadia! Who can forget Laxmikant-Pyarelal’s music in this film with songs such as “Main Shayar Toh Nahin”, “Chabi Kho Jaaye” and “Na Maangun Sona Chandi”? Bobby is an original which celebrates young, teenage love. What really needs to be said about this Aditya Chopra directed film, for which many in my generation swear by, and which established new conventions in Hindi movie romances? This is the movie that made Shahrukh Khan a superstar, and Kajol the bride that everyone wanted. One of the first if not the first Hindi movies showing love between NRIs, with the juxtaposition of Indian values, DDLJ holds a record for being the longest running film in the world (nearly 21 years!). Its songs by Jatin-Lalit, like “Mehndi Lagake Rakhna”, are still played in weddings today and its dialogues are iconic. If you have not seen DDLJ, you have not seen an example of what popular Bollywood cinema is all about. Salman Khan’s debut movie with actress Bhagyashree, directed by Sooraj Barjatya, MPK is also an iconic movie in Hindi cinema. An innocent romance, once again between a rich boy and poor girl, MPK is just as entertaining today as it was in 1989. Raamlaxman’s music with songs like “Dil Deewana” and “Aate Jaate” still create a frenzy amongst fans who grew up watching the film, and many consider it to be the defining romantic movie of their generation. Basu Chatterjee’s incredibly romantic comedy, starring Amol Palekar, Vidya Sinha, Ashok Kumar, and Asrani, is one of my all-time favorites. It tells the story of a young clerk in love with a woman he sees at the bus stop every day, but doesn’t have the courage to speak to her. Desperate, he seeks the help of “Colonel sahab”, who teaches him how to woo the woman of his dreams. Things become hilarious as the clerk begins to woo her, while upsetting a rival suitor along the way. A sweet, true to life story that many can relate to, this movie will bring a smile on your face every time you watch it. Not all romances have to be intense and emotion filled, some can be subtle as well, and that is what this very film does. Another Raj Kapoor directed film starring Rishi Kapoor and Padmini Kolhapure, Prem Rog is special because not only is it an intense, passionate romantic tale but also tackles a very important social issue. The movie is the story of a poor man who is in love with a rich landlord’s daughter, who gets married off to a much older man. Soon, the woman’s husband dies and she is forced to follow the “traditional” traumatic practices that Hindu widows have to practice in India. How the young man who loves her helps her through this difficult time and rekindles the love between them forms the crux of the movie. A truly unique story with great performances and music by Laxmikant-Pyarelal, this is a must see Raj Kapoor classic. A film that I consider to be one of the most romantic ever made, this Gulzar directed mature love story tells the tale of a young ambitious woman who has an interest in holding political office, like her father. This creates a gap between her and her husband, after which they separate for many years, only to meet again in old age. The sensitive acting by the leads (Sanjeev Kumar and Suchitra Sen) make this a compelling watch. Music by R.D. Burman is unlike his usual fare with songs like “Iss Mod Se Jaate Hain”, “Tere Bina Zindagi Se Koi”, and “Tum Aa Gaye Ho”, making them popular choices even today. Aandhi is a reminder of the type of wonderful films that used to be made in the 70s, which are sadly missing today. Interesting rumor is that the movie is said to be inspired from the real life love story between Indira Gandhi and her husband Feroze. I have put these films under the same category because they both have essentially the same story, which is a highly different one. Both tell the tale of forbidden romance between a young aspiring musician and an affluent woman, an alliance which the latter’s parents do not agree with. The woman is married off to a different man, who loves her, but also acknowledges the fact that his wife is in love with another. How he decides to sacrifice his love to help his wife reunite with her true love defines the premise for these movies. A slightly bold subject for Indian audiences, it is truly the ending of these films that make them worth the watch. Oddly, instead of having the two lovers reunite, audiences find themselves rooting for the husband because one realizes that the poor fellow did not have any knowledge of his wife’s previous life before their marriage. He only knew that he loved her. Seeing either film is worth it, as it is an entirely new representation of romance for Hindi cinema. The first film stars Salman Khan, Aishwarya Rai, and Ajay Devgan while the second stars Naseeruddin Shah, Padmini Kolhapure, and Anil Kapoor (in his debut). My list would be incomplete without one Yash Chopra movie, and for me, Veer-Zaara is one of his best works. A cross-border love story between an Indian man and Pakistani woman, the film spans an entire lifetime for the leading characters. The lovers meet under a unique set of circumstances, and are separated by even stranger ones. When they reunite two decades later, that moment (and song “Tere Liye”) makes tears well up in your eyes. Featuring one of Shahrukh Khan and Preity Zinta’s most restrained performances, and one of Rani Mukherji’s best as Veer’s lawyer, Veer-Zaara is one of those rare movies made in current times which are truly romantic and have a soul. These feelings are only accentuated by the music, unused tunes by yesteryear legend Madan Mohan, which give an epic feel to the proceedings. This is truly a celebration of love by the master of romances, Yash Chopra, and no one else could have done it better. As you can see, romance has been presented in many different ways over the years in Hindi movies. This is by no means an exhaustive list, as there are tons of other movies not included which hold a special place in people’s hearts. Romance can be tragic, it can be youthful, and it can also be intense/passionate/mature. Yet across all of these components, what remains common is the understanding of one another, the appreciation of one another, and not simply the desire of having the other person as a part of your life, but actually that other person BEING your life. With that, here’s wishing you happy watching and an even happier Valentine’s Day!